Surrounded by family and serenaded by angels, Rhona Kathleen (Scotney) Allen, moved to her heavenly home on April 12, 2019 at the age of 98. Rhona was born May 20, 1920 to the late Albert and Florence Jane Scotney, In Burlington, South Mountain, Berwick, NS. She was the last surviving member of her immediate family of eleven. Cherished mother of Roberta Allen, Port Elgin, Naureen (George) Mason, Amherst, Elizabeth (Jim) Rogers, Berry Mills, Mary (Yochem) VanSchuppen, Jolicure, Andrew (Florence) Allen, Antigonish, Eileen (George) Millard, Debert, Kenneth (Mary) Allen, Pennfield, and daughters in love, Anne Allen, Amherst and Linda (Ray) Allen-Moore, Amherst. Beloved by her twenty-four grandchildren, and spouses, thirty three great-grandchildren, eleven great-great-grandchildren, fifteen step grandchildren, and one step great-great-granddaughter, totaling 133 altogether, as well as many nieces and nephews. Rhona is predeceased by the love of her life of 70.5 years, David; daughter Darlene, in infancy, sons, David and Eric; sons-in-love, Lloyd Allen and Don MacDonald; three grandchildren; Three great-great-grandchildren and a grandson-in-love, Chad, as well as sisters, Alva, Eileen, Vera, Gabrille, Phyllis, Vendula, and Beatrice and brothers, Albert, Delbert, and Douglas. Rhona married in 1938, and was a devoted wife and mother, creating a home of love and security that we will forever cherish. She was a mother to many others as well and was always looking for ways to make them feel special. She had assisted with the bookkeeping and payroll for her husband's many employment endeavours for many years. Her "Joy" was Jesus first, others second, and herself last. 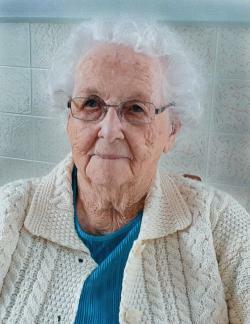 She was an active member of the Timber River Pentecostal Church, even serving on the church board for a season. Well done mom, you have left us with precious memories, a Godly heritage, that home made bread, second to none, your baked beans, and so much more. There is a light beaming brightly now around that heavenly throne. The party's not here you know, it's over there, dear ones, our final home. Rhona's remains have been entrusted into the care of the Jones Funeral Home's Port Elgin location, 3 West Main Street, (538-2241) from where visitation will be held on Sunday, April 14, 2019 from 4-8 pm. A funeral service will be held at the funeral home on Monday at 2 pm. Family flowers only please. Donations in memory of Rhona may be made to the Timber River Pentecostal Church Building Fund, or a charity of the donor's choice. Sharing of memories and condolences may be sent to the family by visiting Rhona's online memorial at www.jonesfuneralhome.ca or through the Jones Funeral Home Facebook Page.